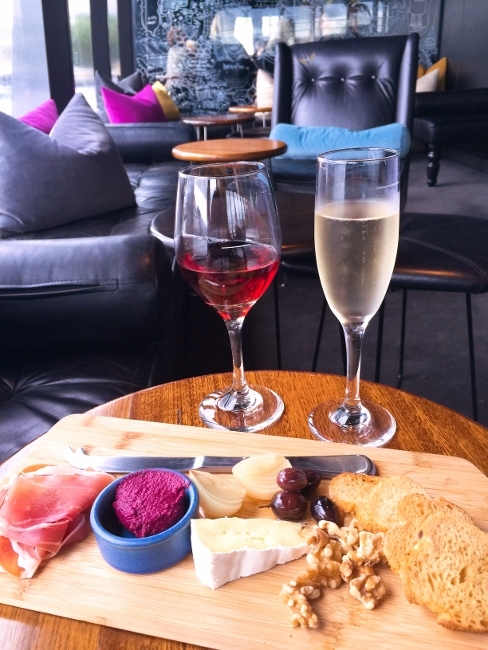 Tasmania Travel - Eat, Drink & Explore! - Live. Love. Laugh. Food. 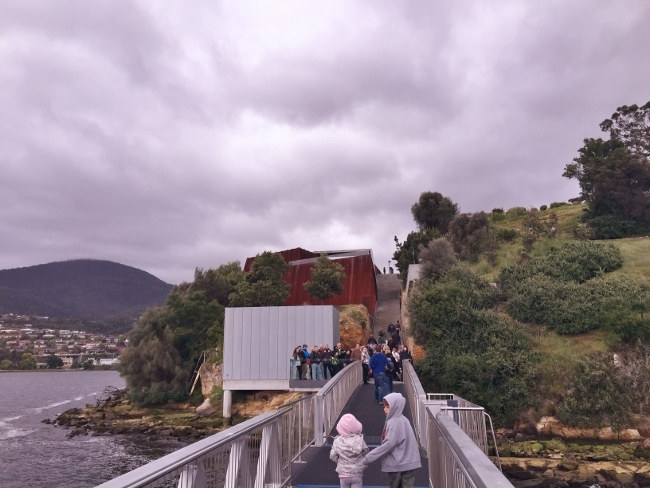 Tasmania Travel – Eat, Drink & Explore! 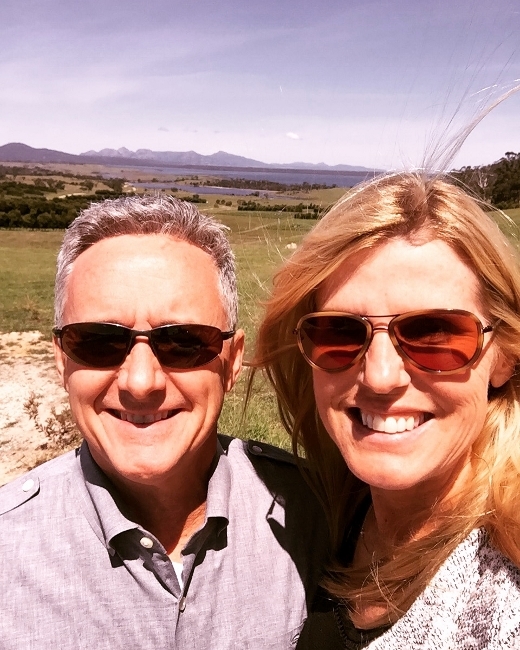 Traveling to Tasmania for the first time was an exciting experience as we flew into Hobart from Melbourne on a quick 1 hour 15 minute flight. 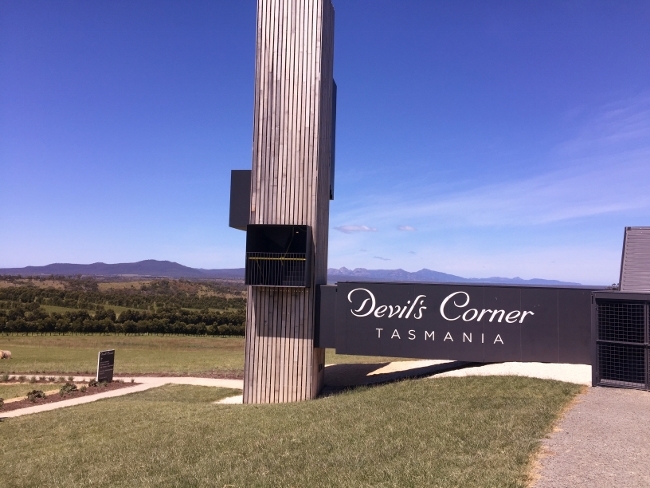 We began our journey by driving northeast towards Freycinet National Park from the airport and made one stop along the way – Devil’s Corner, a newer winery in Tasmania. 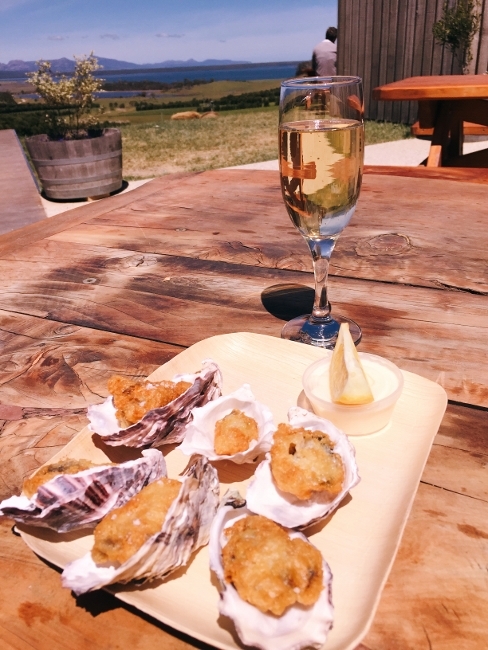 The wines were bright and fresh and we enjoyed the sparkling wine immensely, so we bought a glass, along with some Tempura Oysters with Wasabi Mayo and took in the views. 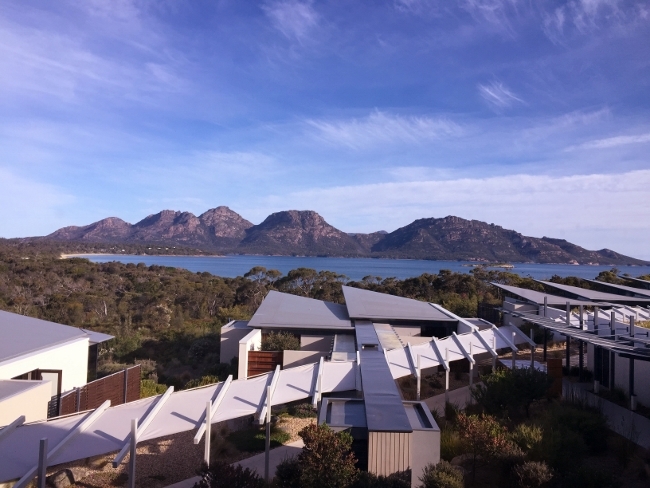 After a bit of wine tasting, we headed to our accommodations at Saffire Freycinet, just a 20 minute drive from the winery. 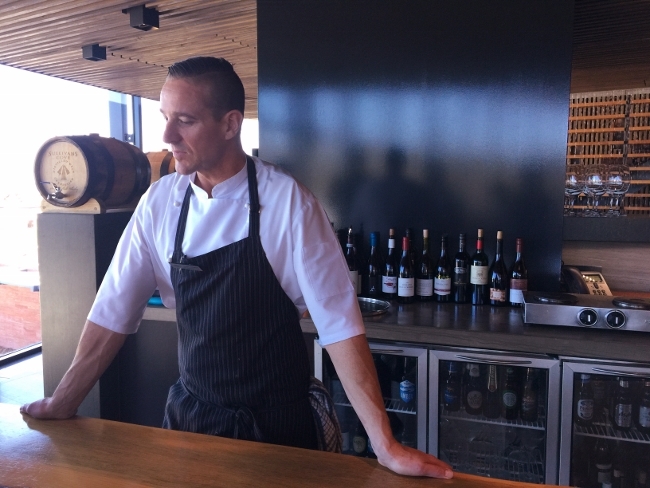 We were greeted upon arrival with a glass of champagne and explored the modern styled resort, which was perched on the edge of Cole’s Bay, overlooking Freycinet National Park. The hotel was quite stylish, without being stuffy and had wonderful art and gardens throughout. 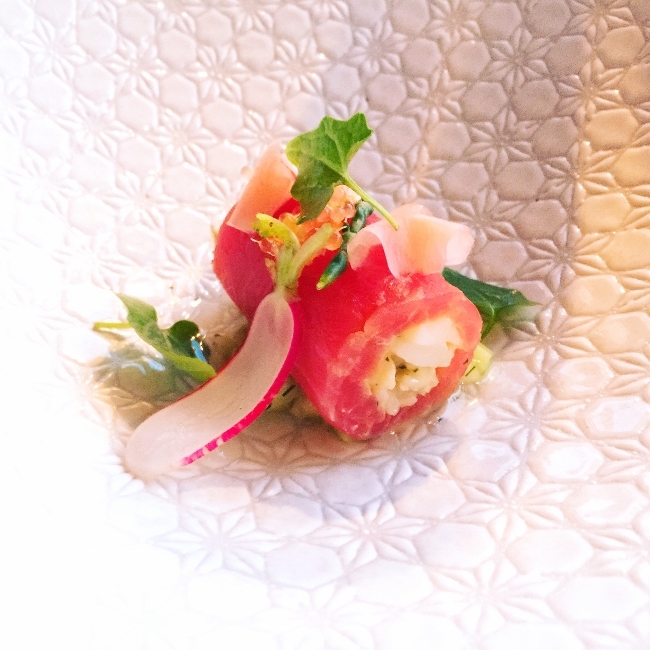 To begin our visit, I headed off for a cooking class with the Executive Chef, Todd Adams. 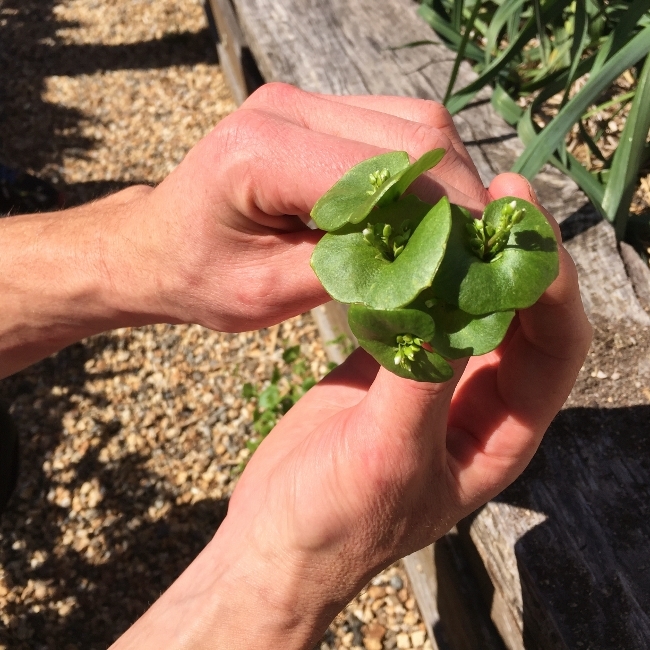 First, we toured the kitchen garden and then observed him preparing an Asian Savory Custard with Vegetables and Smoked Eel called Chawanmushi. 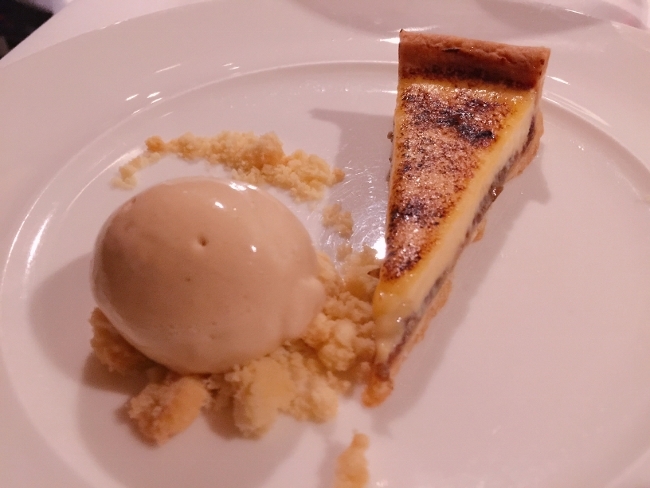 The custard reminded me of a creamy miso soup, delicate and fragrant. 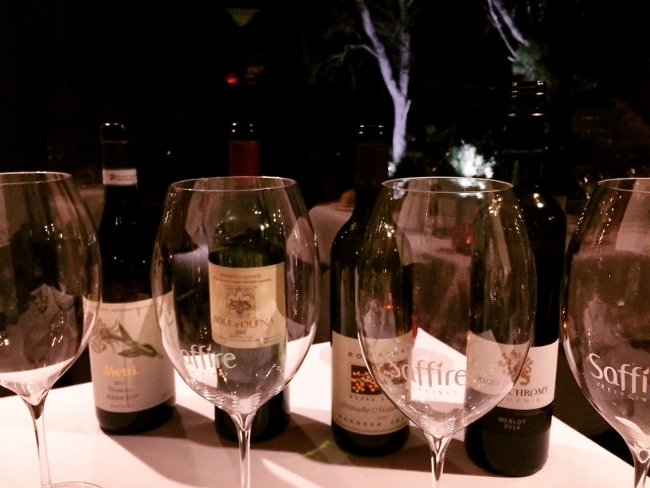 Every evening Saffire had a cocktail and wine hour with nightly canapes, that were stunning. 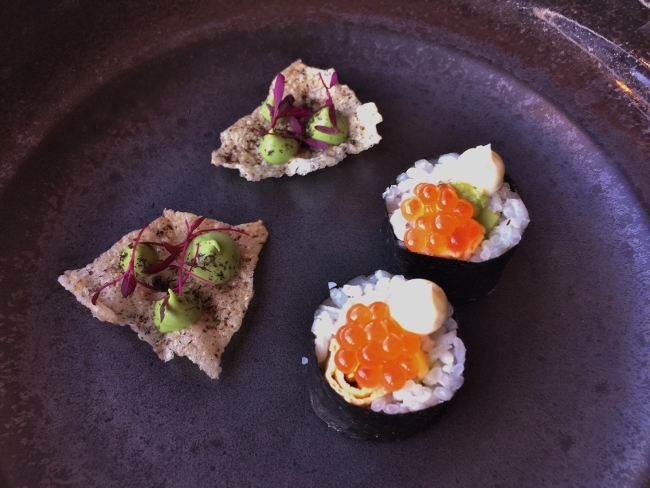 I loved the Miso Egg Sushi with Salmon Roe and the Broccoli Puree on Rice Chip, paired with my second favorite cocktail, a Dirty Martini. 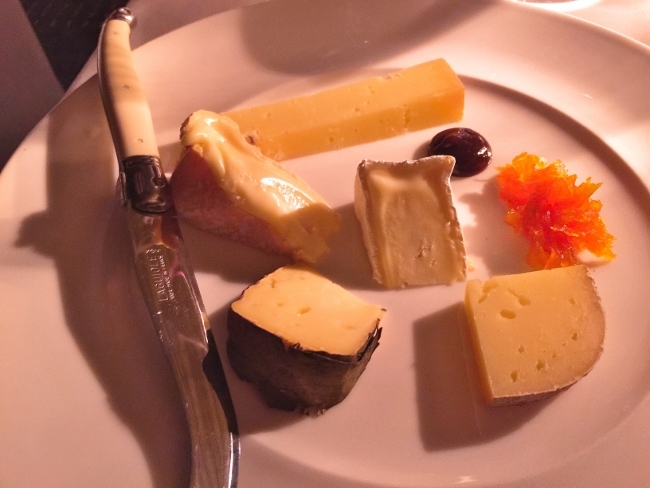 For dinner, an a la carte or degustation menu was offered. and wines from all over Australia. 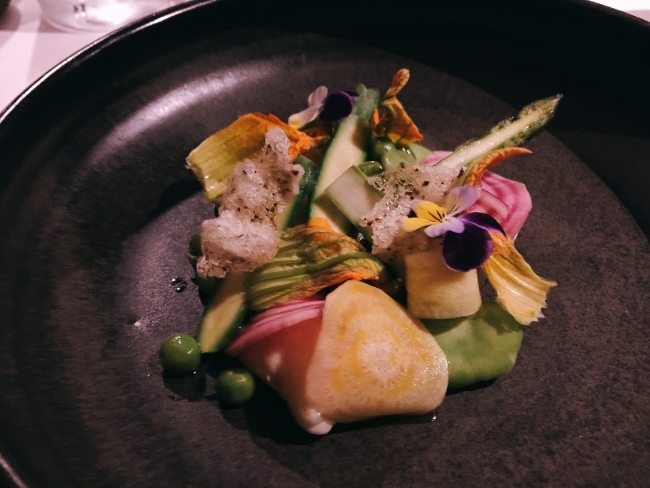 Our first meal was exceptional, starting with a Spring Vegetable Salad with Chilled Gnocchi – light, lovely and garden fresh. 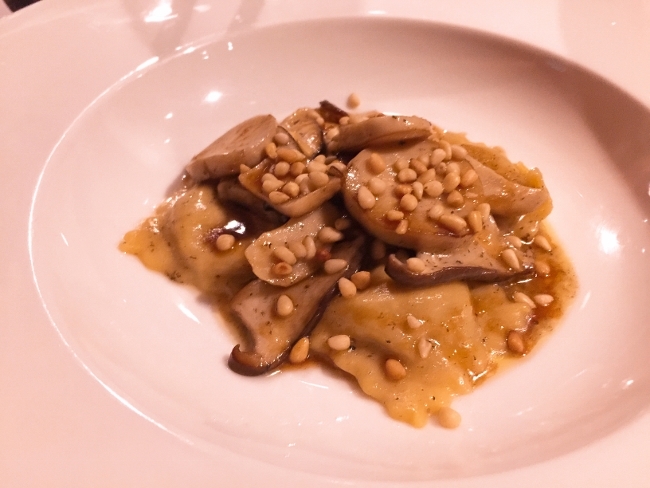 For my main course, I needed a little comfort food, so I devoured the Beef Cheek & Bone Marrow Ravioli, while my husband enjoyed the Wagyu Beef Fillet with Bearnaise & Asparagus. 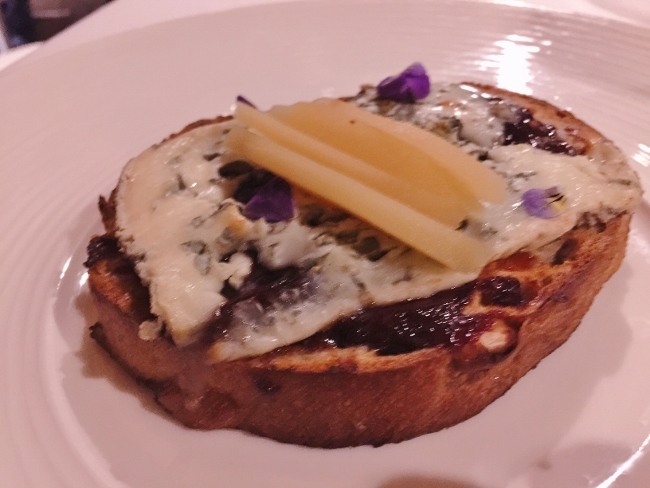 For the cheese course, Tasmanian Blue with Fig Jam and Fresh Pear on Crostini. 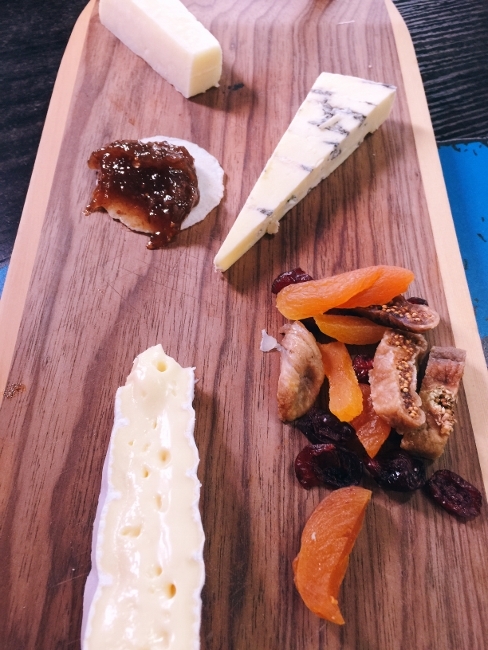 The blue cheese from Tasmania is some of the best in the world. 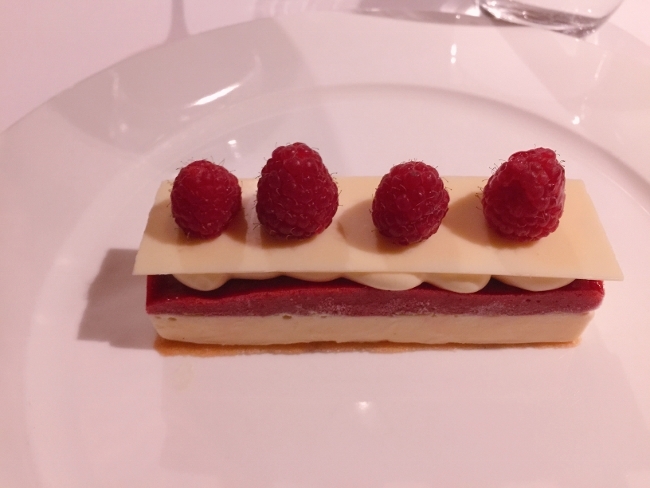 At dessert, we sampled the Frozen White Chocolate Raspberry Napoleon and Creme Caramel Tart. 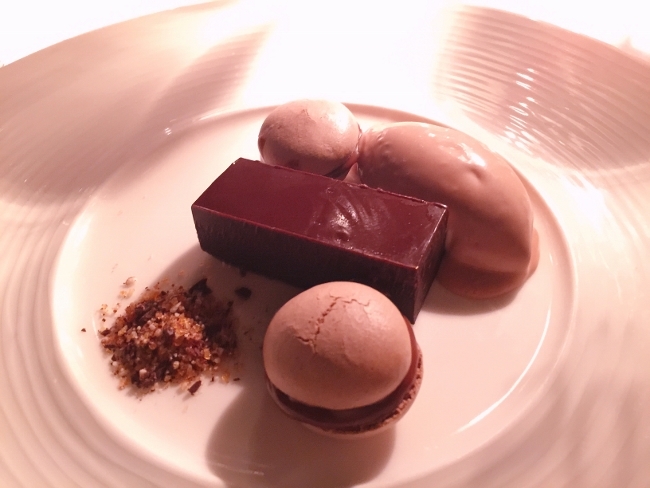 I loved the frozen sorbet and ice cream in the layered Napoleon, very unique. 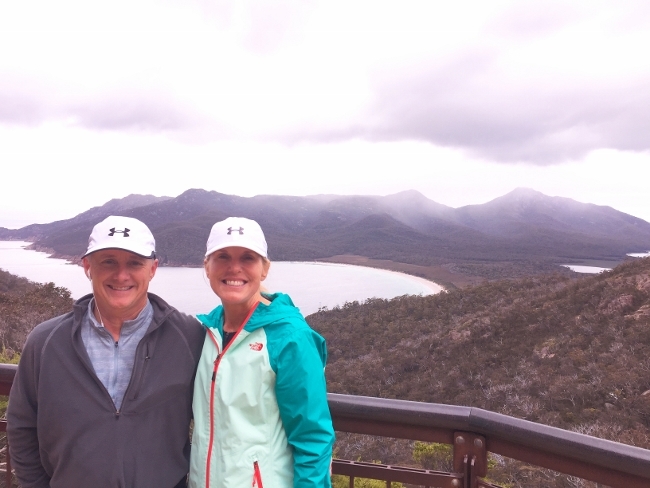 The following day, a small group of us, with our guide, hiked into the Freycinet National Park to view Wine Glass Bay, which was named from the shape of the water. The views were spectacular! 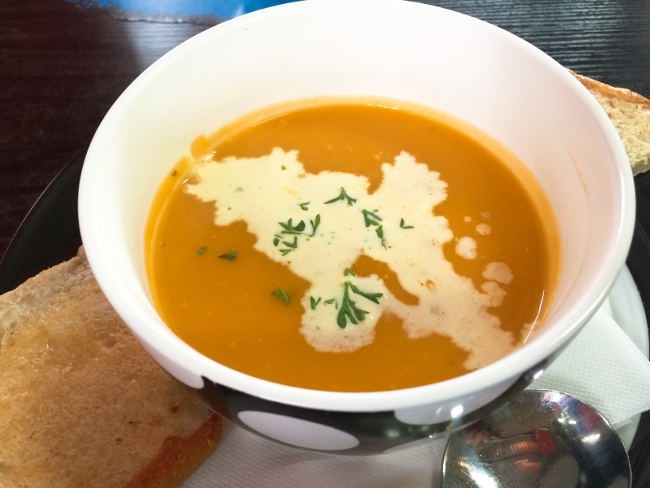 After hiking, a casual lunch with salads and two hot mains were provided at leisure. 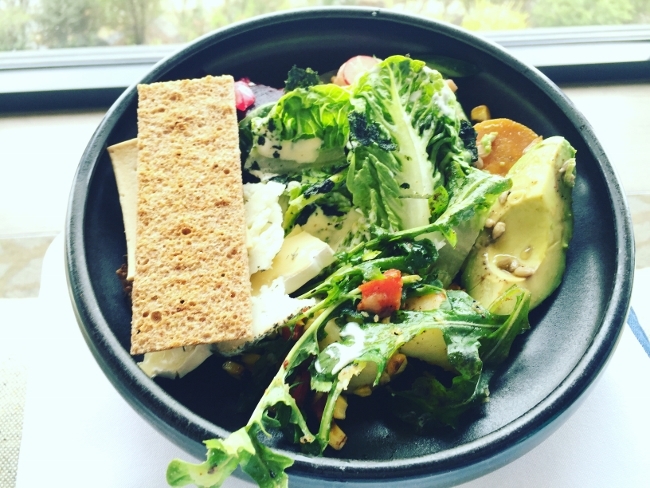 The Romaine Leaf Salad with Nori was absolutely delicious. 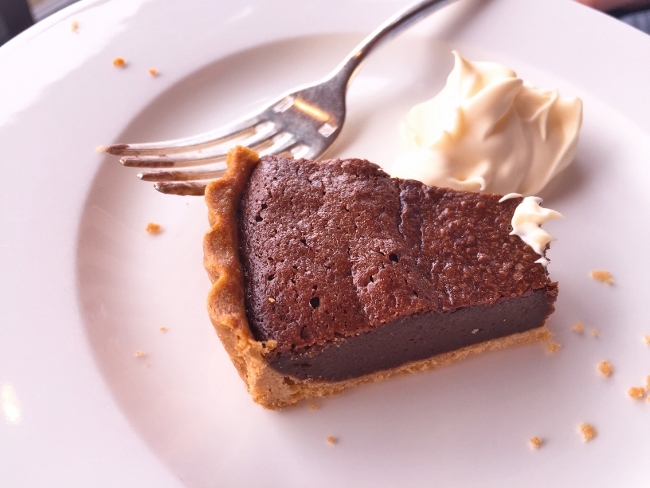 Oh and I can’t forget the Chocolate Souffle Tart with Creme Fraiche. 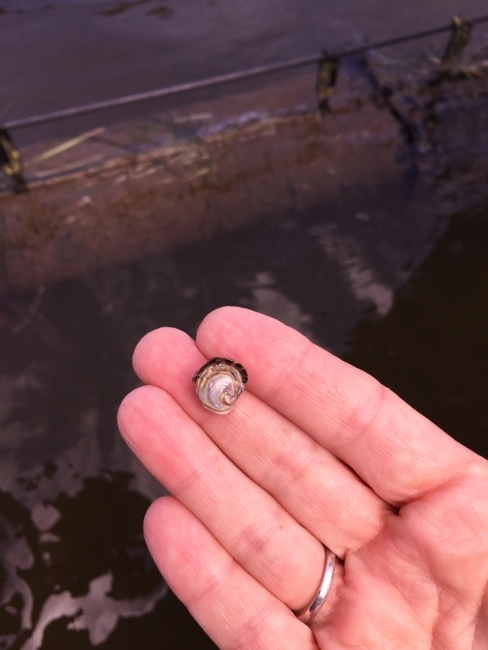 The following day was our local oyster farm experience, where we learned how oysters grow in aquaculture beds, starting with seedling, called Spat. 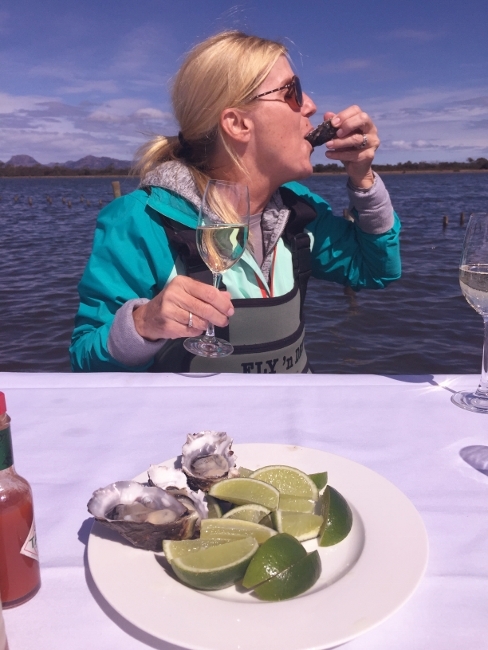 Afterwards, we waded out to a white linen covered table in the water and dined on freshly shucked oysters and champagne – so much fun! 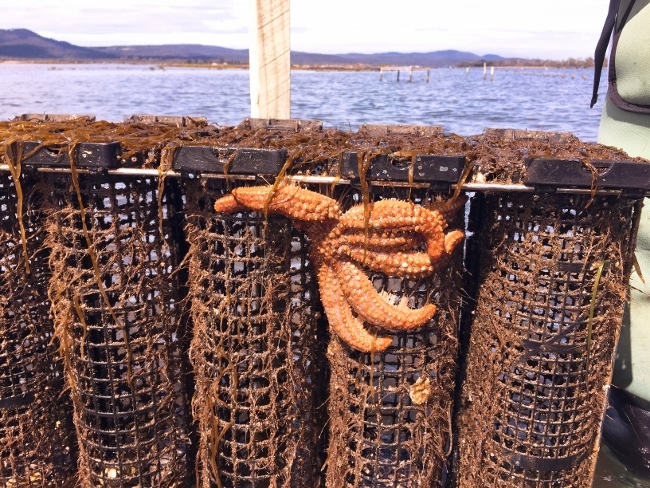 Mr. Starfish was looking for some tasty oysters too – I wanted to give him one of mine! 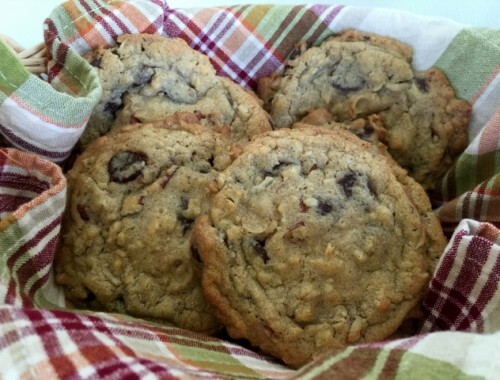 That afternoon, I enjoyed a hot stone message, while my husband took a mixology class by our favorite waitress, Shantall, she was really special. 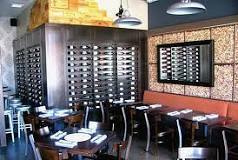 The meals, wine and customer service were exceptional and we really bonded with the staff. 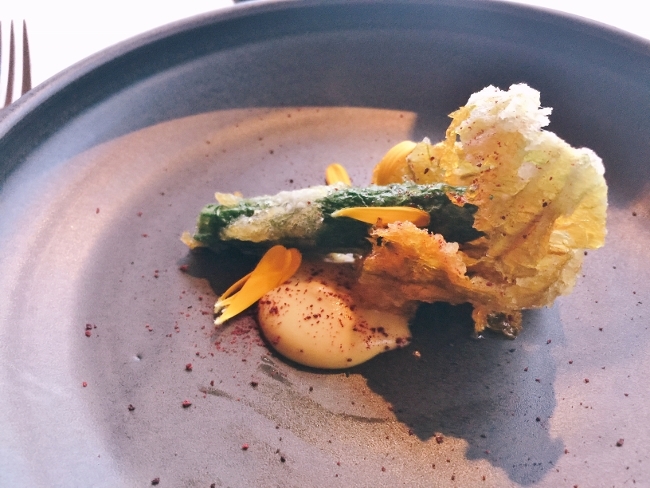 Over the course of the next few days, we had some spectacular food and here are just a few more dishes – Tasmanian Cheese – locally farmed, Zucchini Blossoms with just the right amount of crunch and Swimmer Crab Tuna Sashimi with Pickled Ginger, all lovely. 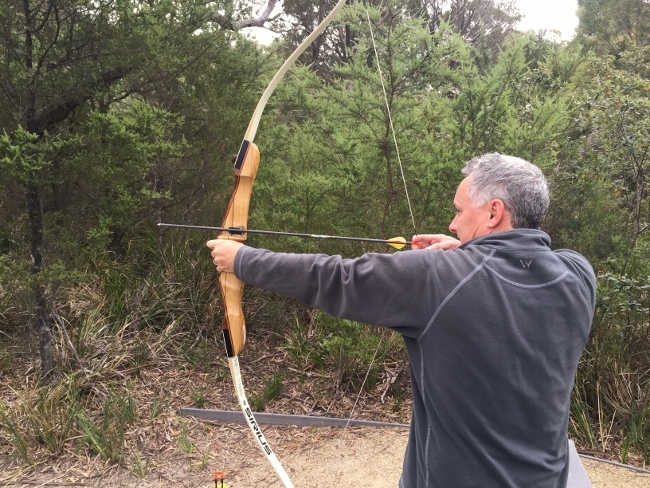 For activities, we embarked on a beach walk, archery class – where we enjoyed a little target practice, followed by a Tasmanian Devil feeding, which was a real eye opener. 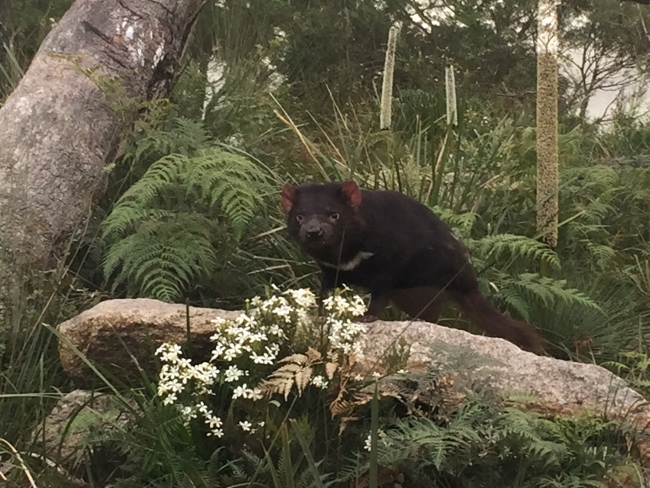 Saffire Freycinet rescues Devils from the wild who can no longer survive on their own. However, at feeding time, where the keeper brings in a piece of raw wallaby for them to share, gets interesting, to say the least. 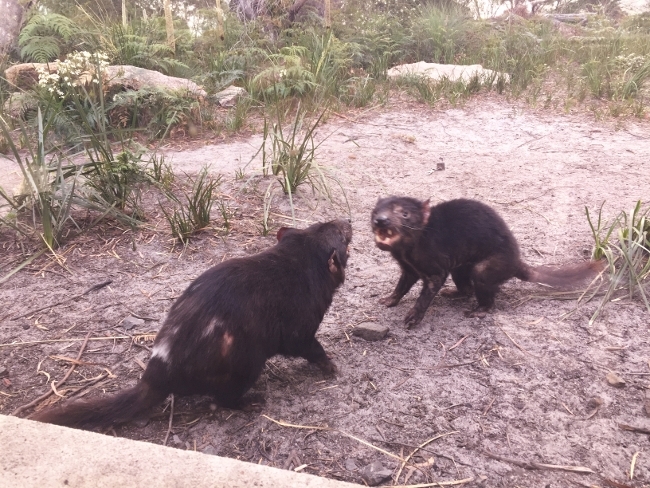 You can see why they are called Tasmanian Devils! 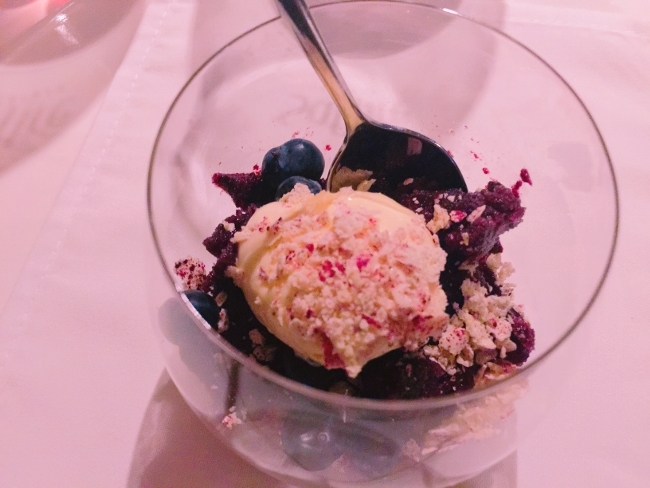 There are so many wonderful things to see & do at Saffire Freycinet and the food was amazing, including the desserts – Granita Blueberry Crumble with frozen and fresh Blueberries, Oatmeal Crumbs over Creme Fraiche and a Chocolate Lovers Dessert with Macaron, Ganache Bar and Double Milk Chocolate Gelato. 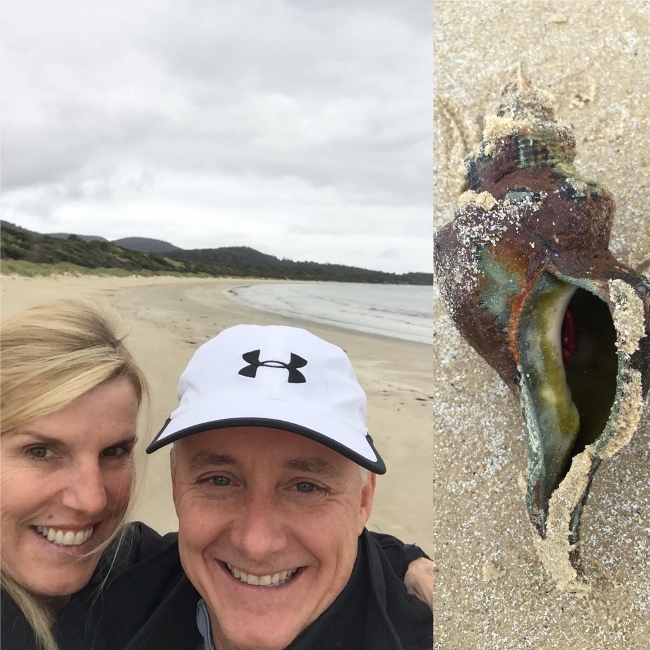 After three nights in Saffire Freycinet, it was time to head back south 2 hours to Hobart and explore. 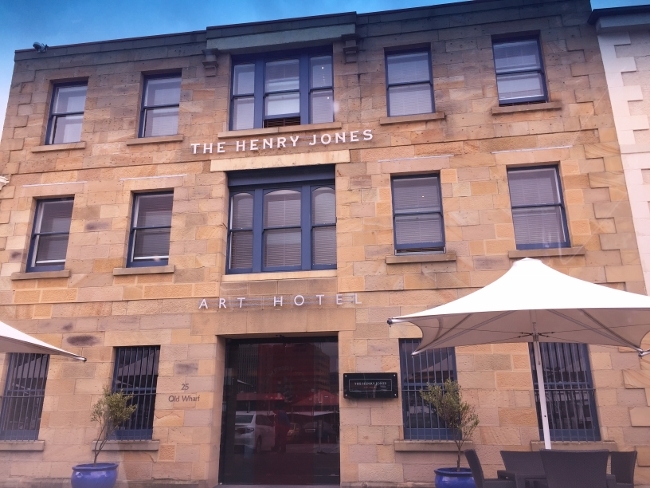 We checked in to The Henry Jones Art Hotel for our two night stay. The hotel has so much history, being a former jam factory from the 1800’s. 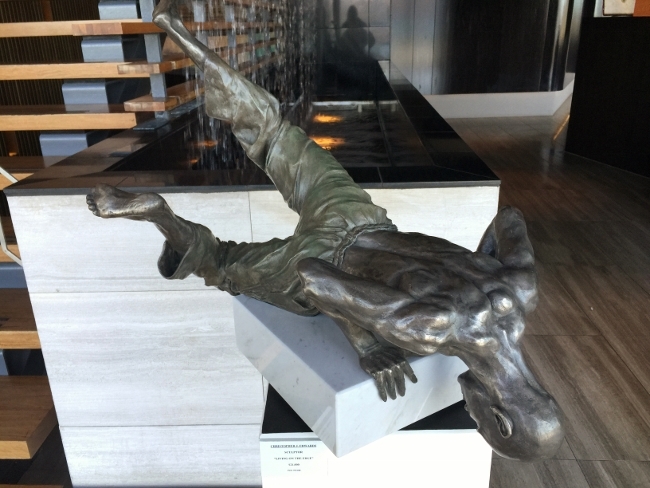 It houses some of the finest art in the city, which you can view wandering the corridors of the hotel. Our first stop on Saturday was the Salamanca Market, a local flee & food market held from 8-3 p.m. The stalls are loaded with local arts and crafts, as well as a smattering of prepared foods and coffees. Afterwards we boarded the Mona Rider to head to the Mona Museum, to check out the modern art. The Mona Rider is a large scale catamaran that takes people to and from the museum, but if you upgrade to the Posh Pit, you get a complimentary cocktail and canape, which makes the ride – oh so fun. 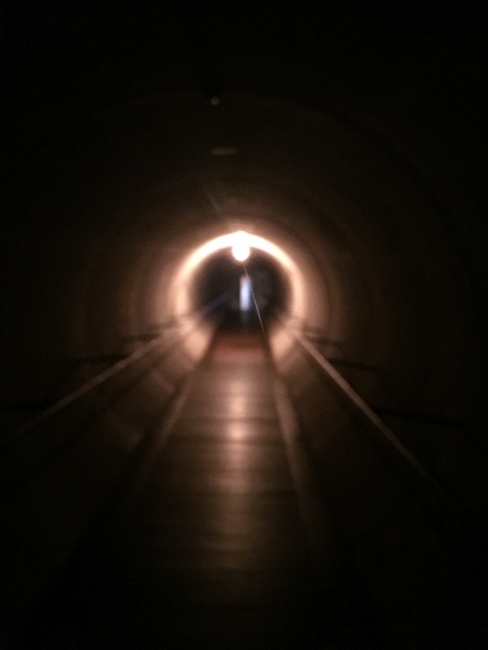 The Mona Museum takes old & new art to a new level. 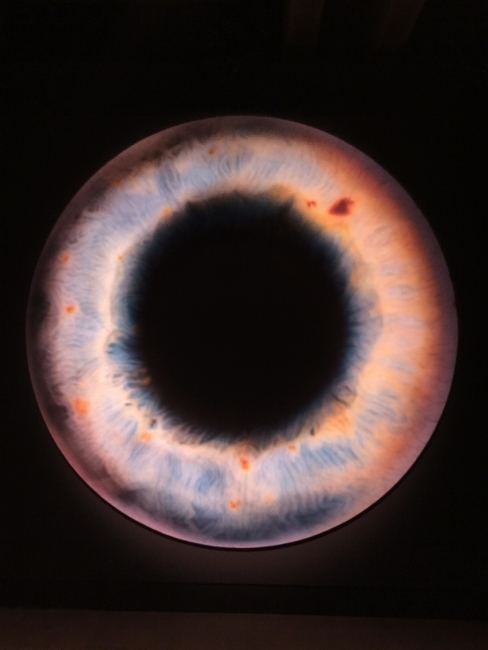 Be aware of the posted signs for information on how to view each exhibit – there are many things that will surprise you, here is a small sample. 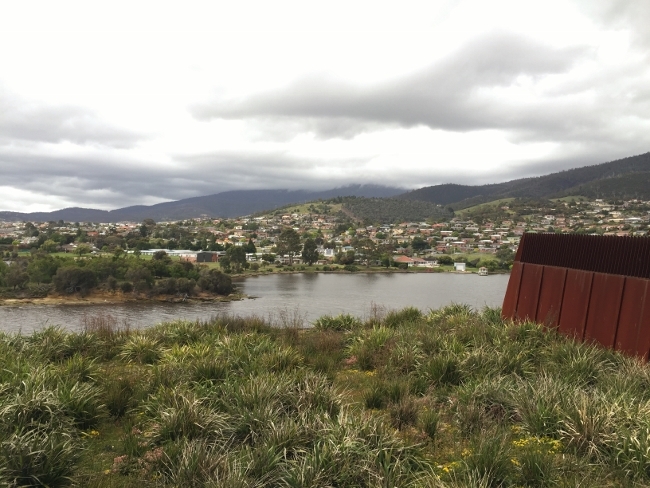 There were great views from the outside of the museum, which give you a better perspective of the city of Hobart. Also, there was a winery on the property for tasting. After the museum we ended up with a late reservation at Franklin, which has one-hat in Tasmania. 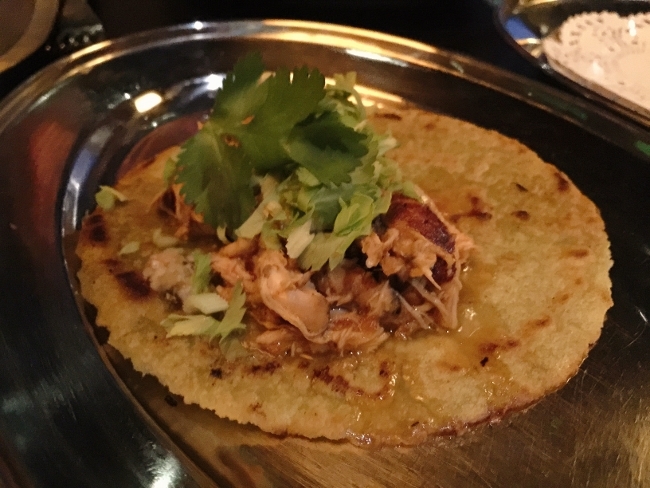 Our scheduled reservation for 8:45 p.m ended up being 9:15 p.m. and the staff and chef seemed to have been checked out by then. 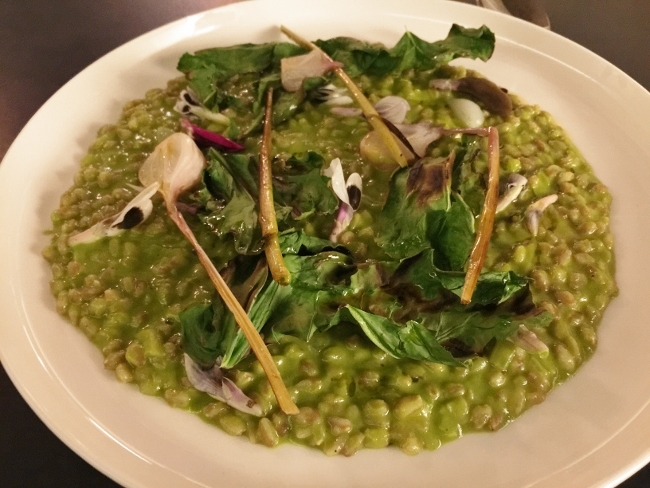 However, I did enjoy the Grains and Greens dish, which was a broccoli puree cooked with barley, risotto style. The next morning we stopped in Pigeon Hole Bakers, for a quick pastry before we headed to Coal Valley for a little wine tasting. 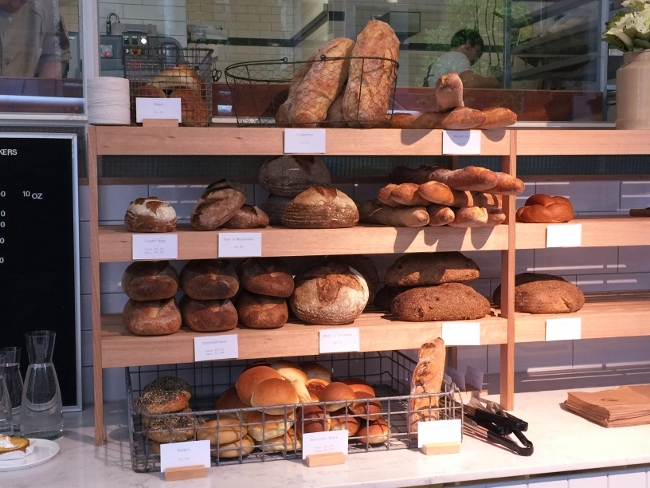 The bakery made the breads at Saffire Freycinet, which I fell in love with, so I definitely wanted to stop and taste their pastries. 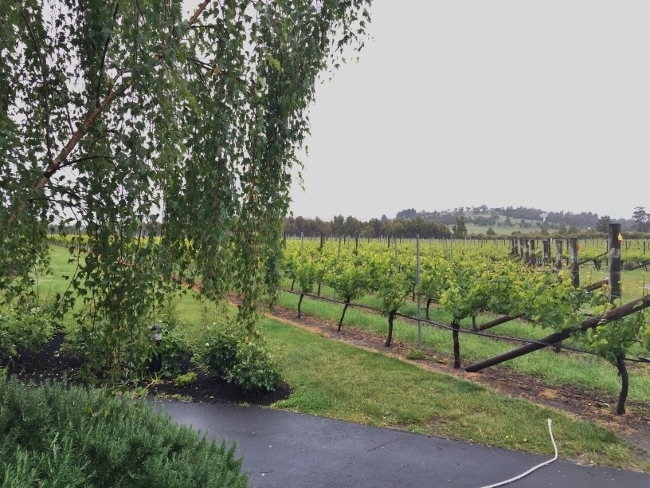 Afterwards we drove out to Coal Valley to taste a little wine, but the weather was not cooperating…rainy and cold. 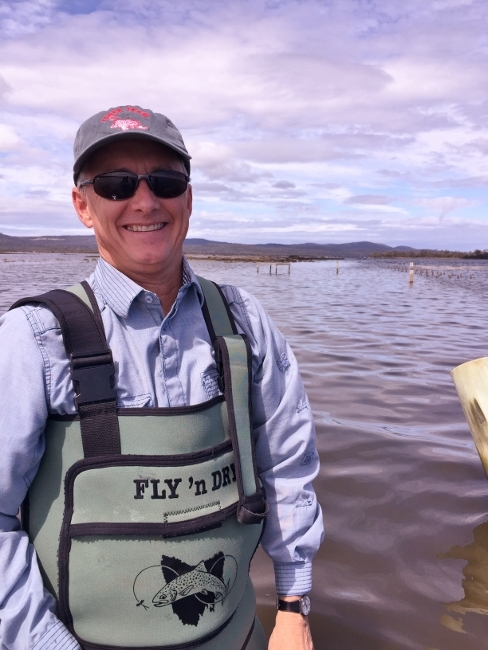 Originally we had a Bruny Island Cruise scheduled, but due to weather it was cancelled. 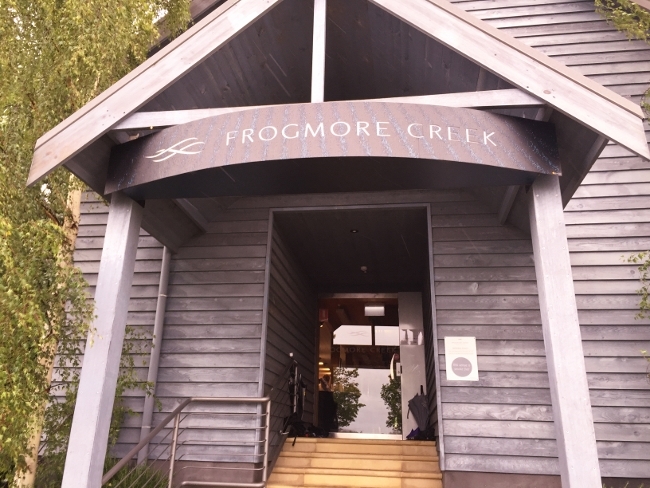 So, we headed to Frogmore Creek to taste the wines, which where young and fresh. We loved the gal who assisted us, whose names escapes me. Afterwards we stopped in to Wicked Cheese Company in Richmond, for a Cheese Platter and bowl of Pumpkin Soup. 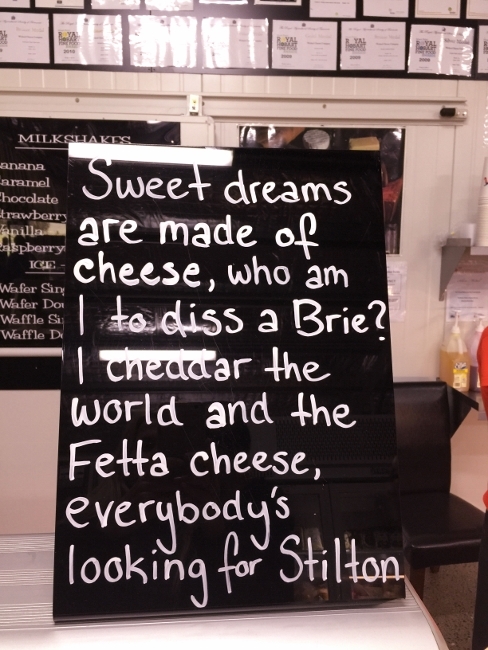 The staff was kind and the food hit the spot, on a rainy day in Tasmania and I especially loved the sign posted in the shop. 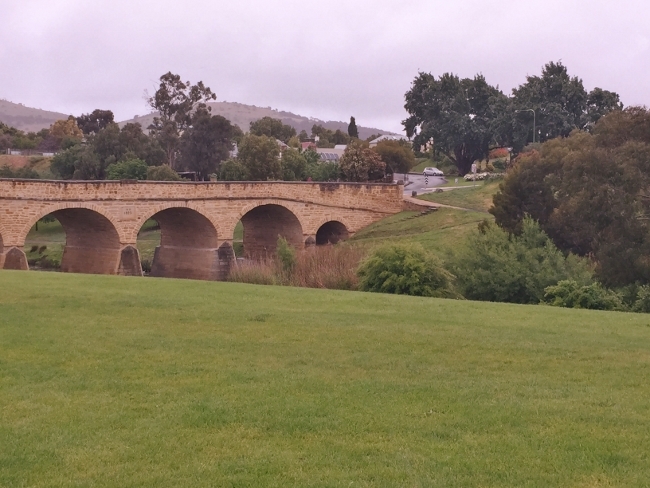 Afterwards, we briefly drove through the town of Richmond, to see the historic bridge and the one-street town….very charming. 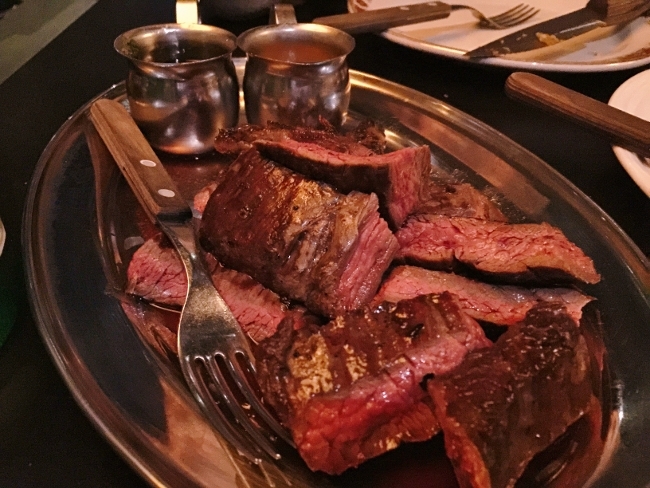 That evening, we dined at Frank, not to be confused with Franklin, where the chef was creating an Argentinean Style menu with Brazilian meats, vegetables and tapas. 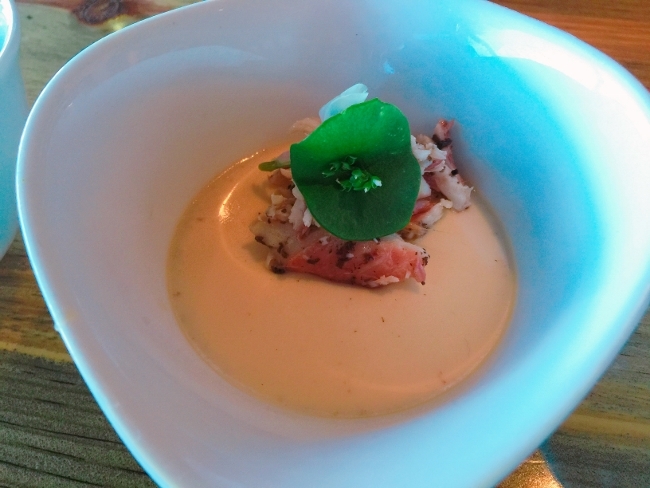 The food and service were deliciously entertaining and we enjoyed our experience. 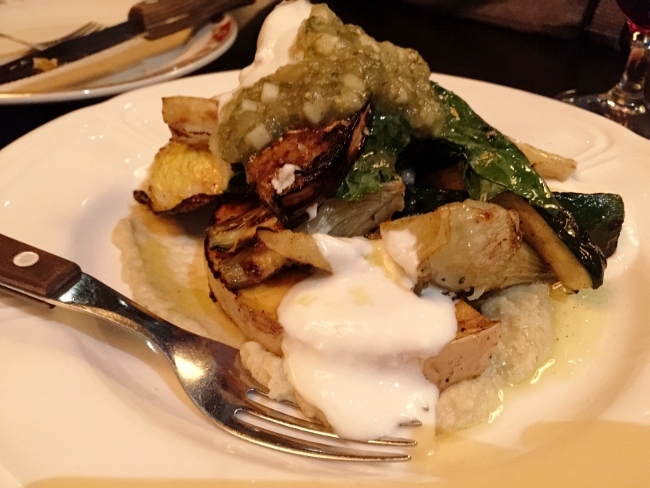 I loved the grilled vegetables with tomatillo salsa and fresh crema. 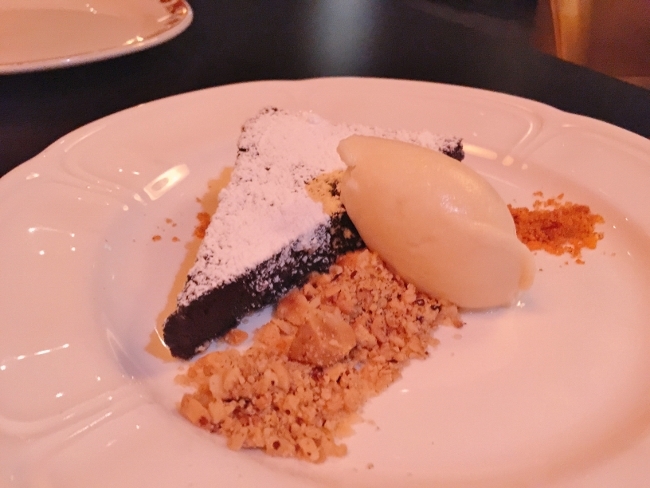 The Flourless Chocolate Cake with Macadamia Nut Crumbs, Smoked Paprika and Dulce de Leche Ice Cream was delicious. 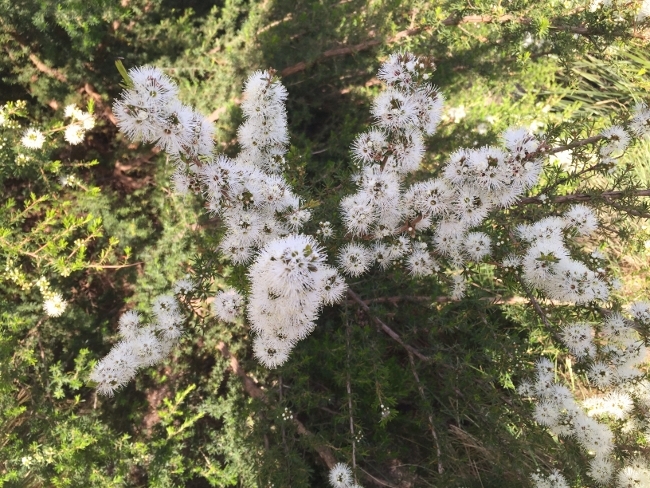 Tasmania is the perfect place in Australia to enjoy the beauty and wonder of the outdoors with a tranquil seaside capital, Hobart. 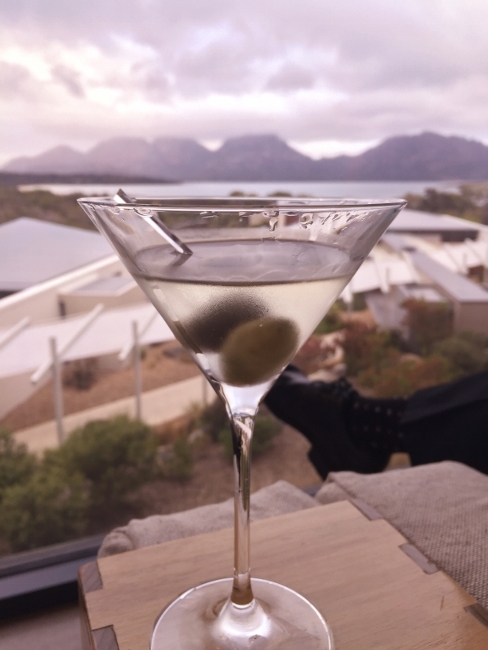 The mix of culture and adventure was fantastic and we especially enjoyed our time at Saffire Freycinet, though quite a splurge. 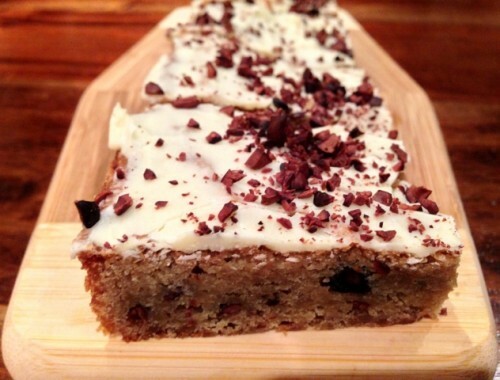 Cocoa Nib Blondies with White Chocolate Glaze – Recipe!